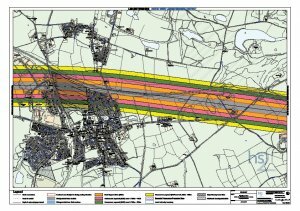 Go to https://www.gov.uk/government/collections/hs2-phase-2b-working-draft-environmental-statement#volume-2:-community-area-reports-and-maps to view the latest maps and information. 1) How many houses are due to be demolished in Measham if the July 2017 route is the one finally approved? HS2 Ltd is unable to provide specific details of individual properties which may need to be demolished in the Measham area. During the route development stage, including the 2016 Appraisal of Sustainability, HS2 Ltd only reported clusters of demolitions (defined as five or more properties). It is important to note that demolition counts are based on the known earthworks of the alignment at this stage of the design process and are therefore likely to change with further design development and environmental assessment. Demolition figures will be updated for the working draft Environmental Statement (WDES), which will be consulted on later this year. 2) Approximately, for how long will Measham residents experience disturbance due to noise and disruption due to closures of transport links once preparations for, and the construction of, the HS2 line begins? It is currently anticipated that construction would commence in 2023, at the earliest, following Royal Assent of the Phase 2b hybrid Bill in 2022. The construction phase would start with early works, such as utilities and highways diversions, and habitat relocation, prior to the main construction works commencing. These would continue through to 2032 when the line will be subject to testing and commissioning prior to operational services starting in 2033. It is unlikely that there will be continuous construction works in a single area along the Phase 2b route for the entire construction phase. While there could be potential exceptions for areas of significant works, such as stations, the majority of areas will experience phased construction works across the construction period, with some periods of works and some periods of inactivity. More detail on the expected construction phasing will be available in the Environmental Statement deposited with the Bill. Emerging proposals will be available in the WDES, which will be consulted on in 2018. 3) When HS2 switched to the disastrous 2016 route, the reasoning included preserving the canal/Wharf development, but when the 2017 route was announced why was no mention was made of the canal/Wharf project? 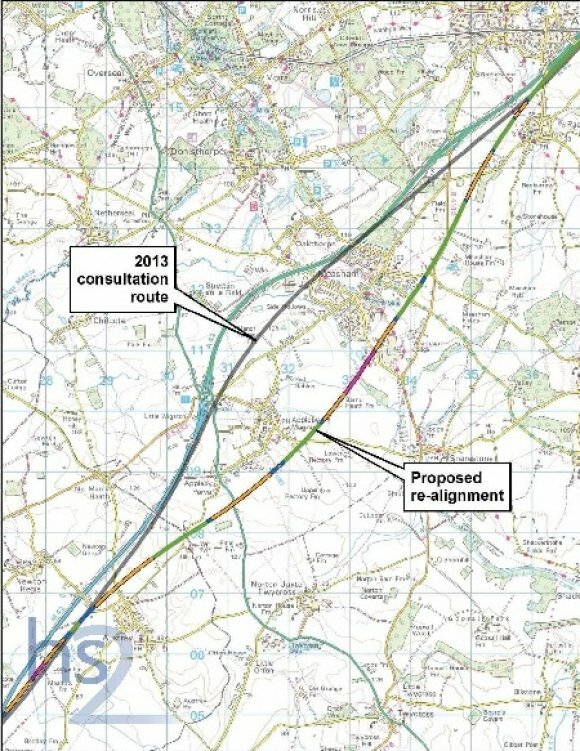 "While this route slightly increases the impact on the Measham Wharf development site, as mentioned above, the 2016/17 consultation response from North West Leicestershire District Council indicated that they have alternative locations that will enable them to meet the strategic housing allocation targets for the area." "The Secretary of State has also noted the view of North West Leicestershire District Council that alternative housing sites to Measham Wharf should be available if necessary." The impact that returning to a route in the A42 corridor would have on the Measham Wharf development site was considered by HS2 Ltd when determining its recommendation, however, it was considered that, on the balance of evidence, that a route in the transport corridor would have a lower overall impact than the route to the east of Measham. 4) There will be 29% of the London to Birmingham route in tunnels, but only 2% from Birmingham to Leeds and less than 0.5% in Leicestershire. Why is HS2 spending far less on mitigation in phase 2b than in phase 1? Phase One of HS2 is several steps ahead of Phase 2b. Following the confirmation of the Phase 2b route in July 2017, HS2 Ltd is beginning the process of further developing the design of the scheme, in order to deposit a hybrid Bill in 2019. As part of this, we will be undertaking an Environmental Impact Assessment, which will identify the significant effects that the construction and operation of the Phase 2b scheme are expected to have. HS2 Ltd will also include in the design of the scheme a range of measures to attempt to mitigate these effects. The publication of the WDES in 2018 will present the findings of the draft EIA and present details of the measures that will be added into the design of the scheme to further reduce HS2's impacts. A consultation will be held on the WDES in 2018. This approach is consistent to that which was followed on Phase One and Phase 2a of HS2, and will be followed in the same way across both legs of Phase 2b. HS2 Ltd will not deliver a lower standard of environmental protection on the Phase 2b route than to that which has been delivered on previous schemes. We are at the very early stages of design for the route between Birmingham and Leeds, and are committed to working with communities and stakeholders to identify appropriate solutions to further reduce impacts. 5) Are all owner occupiers being offered the same compensation terms by HS2 Ltd? The same disturbance package is offered to all claimants, i.e. 10% home loss along with all disturbance items. This being said, some claimants will need to claim for more disturbance items than others as they've incurred more costs, some mortgage packages for example charge an admin fee to port it, whereas some claimants will not incur this cost. 6) Are HS2 Ltd offering any form of financial assistance to people renting their property either from a public or a private landlord with the cost associated with finding somewhere else to live and the associated removal costs? HS2 Ltd is not offering compensation at this time to those who live in rented accommodation, unless they have more than three years left on their lease. If a property is compulsory purchased when the claimant is in situ and they have been there for more than a year then we will pay occupiers loss (7.5% of property value) and disturbance costs, such as removal costs. 7) Will a Community Forum approach, as used on Phase 1 of the HS2 route, be adopted on the Phase 2b route? HS2 Ltd is committed to listening to communities across the route. On Phase One, community forums were one approach we took to liaise with communities, as engagement colleagues worked across large sections of the route. On Phase 2b, we have a dedicated engagement team to cover just the stretch of the route from Appleby Parva to Kegworth and therefore have more of a resource to dedicate to communities, offering more regular, individual meetings to affected individuals. We are reviewing whether community forums are the best approach for this stage of the project on 2b. 8) Will HS2 trains, operating at their normal operation speeds in this area, generate Rayleigh Waves and if so, how far will they travel? The HS2 route in this area has a design speed of 360kph. HS2 Ltd is working with its consultants to design the foundation and structures to support the track in this area. The design includes carrying out ground investigation and collating data in order to understand the speed of the train and it's relation to the Rayleigh Wave the train might generate. 9) What different forms of track bed will be used in this area and what noise implications arise both from operating the trains and maintaining the different forms of track bed? HS2 Ltd is in the process of determining the track form. The decision will be determined by engineering, operation, maintenance, environment considerations and whole life costs. Once recommendations are accepted by DfT, a formal announcement will follow. With regard to the use of different forms of HS2 track bed to be used for the Phase 2B route, i.e. ballast or a concrete slab track (or a combination of both), the engineering design process is still ongoing and a decision has not yet been made. In terms of the acoustic performance and maintenance characteristics of the track bed, HS2 Ltd is aware of the relative merits of both ballast and slab-track systems, and the HS2 predictive noise modelling and assessment process will reflect the design selected. 10) What progress has been made on minimising the level of noise that will be generated by the pantograph or won't we know that until the contract for building the rolling stock has been placed? The rolling stock contract for HS2 is at bidding stage, therefore the information regarding noise generated by the pantograph is not currently available. 11) When will the working draft document be published? The working draft Environmental Statement will be published in late 2018. On the 17th July the Government took the decision not to adopt the proposal of the route to the East of Measham. Instead it has confirmed a refined version of the route proposed initially in January 2013 which follows the A42. Follow the link above to view a map of the confirmed route. Measham Parish Council approved the following consultation responses at their meeting of 9th February 2017. Response from Measham Parish Council to the HS2 Route Refinement Consultation. Response from Measham Parish Council to the HS2 Property Consultation. Submission from MAPA, (Measham, Appleby, Packington & Austrey HS2 Action) on the reroute of HS2). The consultation closed on 9th March. For enquiries email HS2enquiries@hs2.org.uk or telephone freephone 08081 434 434. November 2013 Statement from Parish Council with reference to the Consultation on Governments preferred route for HS2. a. the concept of HS2 is flawed, in so much that the undertaking will not give the tax payer value for money, and that the information on the future supposed benefits to this Country is based on guesswork and on figures which have no foundation. The siting of the nearest station to Measham at Toton, would negate any time saving from HS2, and increase road traffic. The time quoted by HS2 Ltd for journey times between Nottingham city centre and Toton does not stand up to scrutiny, as they have failed to demonstrate how they would deliver this. b. There will be no benefit to the residents or businesses of Measham, but there will be a detrimental effect on the well-being of the local inhabitants, due to noise pollution, and to the beautiful countryside, and wildlife. c. There will be a detrimental effect on the National Forest, with the fragmentation of woodland, contrary to the recommendations of the Lawton Review of 2010. There will also be destruction of re-forested woodland, and this will also affect the recreational activities of our residents due to footpaths being crossed by the preferred route. d. Due to the proposed very extensive roadworks required around this village, if these plans are adopted, the population of this village will be severely affected by the disruption caused. This has already blighted the village, with the anticipation of the road closures, heavy equipment, noise and air pollution. This blight extends to the value of properties, and it is expected that house prices in the area will reduce or remain static, at a time when house prices in other parts of the country are expected to rise by 25% over the next 5 years – therefore making it difficult to relocate without increasing mortgage commitments. The blight on the residents of the village will continue, should the Government's proposal be accepted, with the 12 – 18 trains going through the village every hour. e. Measham, being within the National Forest, would have hoped to benefit from increased tourism due to its location, and to the fact that long term plans include the extension of the Ashby Canal. These include building a Wharf in Measham, and having a Marina close by. f. Most countries which have High Speed trains, have been in operation for up to eight years. If the time scale for HS2 is correct, it will be 20 -25 years behind those countries, and they will, more than likely, have become outdated due to advances in Communication technology. Therefore Measham Parish Council objects to the proposed HS2 and to the Government's preferred route. a. Works on roads in the vicinity of our village are properly staged, so that inconvenience to the residents is kept to a minimum. ii. Finances are made available to allow the Ashby Canal to be joined from its present location to the Donisthorpe section of Canal. c. Effective sound proofing is put along the whole route to protect the wellbeing of the residents of Measham. d. Compensation is paid to all who suffer disruption to their lives from construction work, e.g travel delays and additional cleaning from air pollution etc. The consultation on the proposed phase 2 closed on 31st January 2014.